Elon Musk is viewed as one of the boldest and most innovative CEOs in the world. That's part of the reason why Tesla Motors Inc. (Nasdaq: TSLA) stock has seen a meteoric rise of 515% since the start of 2013. And Musk made a bold move today when he opened up all of Tesla's electric vehicle patents. Musk is giving his competitors a leg up in hopes of jumpstarting the electric vehicle market. 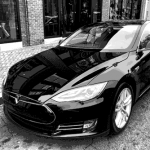 Tesla Motors Inc.'s (Nasdaq: TSLA) signature Model S sedan has a base retail value of just below $70,000 but the luxury version of the vehicle costs well over $100,000. And when looking at the Tesla supplier list, you get a glimpse of the intricacies of Tesla's electric vehicle. 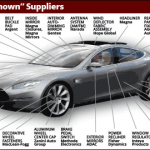 There are at least 26 companies that contribute parts to the Model S sedan. 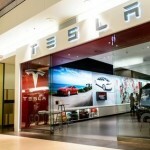 Tesla Motors Inc. (Nasdaq: TSLA) stock is down more than 6% in afterhours trading today (Wednesday) despite the fact that the company beat earnings projections in the first quarter. Tesla announced adjusted earnings per share (EPS) of $0.12 per share, which was above consensus estimates of $0.10 per share. Tesla Motors Inc. (Nasdaq: TSLA) announced this week that customers in China can start purchasing Model S sedans through Alibaba Group Holding Ltd.'s online-payment platform Alipay. For now, the Alibaba partnership should make purchasing a Tesla vehicle online easier for Chinese consumers. In a public event today (Tuesday), Tesla Motors Inc. (Nasdaq: TSLA) CEO Elon Musk hand-delivered China's first Model S sedans to customers in Beijing. Selling vehicles in China marks a major milestone for the company as it continues to raise its global sales goals. As the world's largest auto market, the potential in China is huge for Tesla. 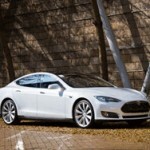 When you think about Tesla Motors, do you consider it an auto company or a tech company? If you're having a tough time choosing, you're not alone. A lot of investors and analysts are getting tripped up by Tesla's unusual hybrid nature as a maker of innovative electric cars. That confusion explains why Tesla has been such a volatile stock. The answer isn’t as hard as it looks – and it sheds a lot of light on where TSLA is headed from here. 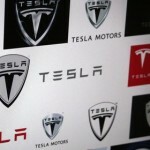 Tesla Motors Inc. (Nasdaq: TSLA) stock rebounded from March losses today when it reached a two-week high of $235.73 in early trading. The stock has since pared its gains, but is trading up almost 9% on the week. Tesla had been one of the hottest stocks of the past year, posting a gain of 637% from the start of 2013 through February 2014. If you live in New Jersey and want to purchase a Tesla Motors Inc. (Nasdaq: TSLA) signature Model S, you have until March 31 to do so. 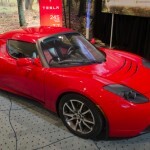 Tesla announced yesterday (Tuesday) that as of April 1 it will no longer sell its vehicles in New Jersey, following the New Jersey Motor Vehicle Commission's ruling that automakers must sell their vehicles through auto dealerships. 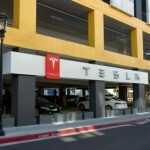 Tesla Motors Inc. (Nasdaq: TSLA) stock has seen a meteoric rise since its initial public offering in 2010 - up more than 1,200% in less than four years. In 2014, TSLA stock has climbed nearly 70%, and in the past 12 months it's up 618%. 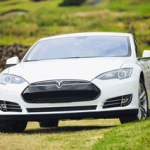 Tesla Motors Inc. (Nasdaq: TSLA) stock is up 622% in the last year and 66% in 2014. TSLA hit another all-time high last week following the announcement of the Tesla Gigafactory, which could revolutionize the lithium ion battery market. Trading around $250 per share, investors are wondering what to do with Tesla stock. Tesla Motors Inc. (Nasdaq: TSLA) stock reached its all-time high yesterday (Tuesday) of $202.20 shortly after the market opened. That was after setting another record high on Monday of $196. TSLA stock has been on fire this year, up nearly 31% in 2014. More impressive, that rally has occurred during a market sell-off that's seen the Dow Jones Industrial Average and the S&P 500 dip 3.6% and 1.5% respectively. The biggest automakers have come out with earnings and sales news this week, giving investors a better idea of the best auto stocks to buy now. General Motors Co. (NYSE: GM) recently announced it will reinstate its quarterly dividend. 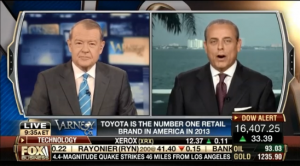 Toyota Motor Corp. (NYSE ADR: TM) was the top retail brand in the United States in 2013. 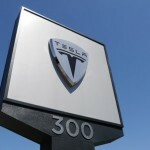 Tesla Motors Inc. (Nasdaq: TSLA) announced that it will be "upgrading" 30,000 Model S power adapters. 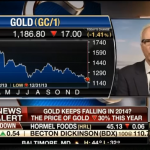 Today (Tuesday), Money Morning Defense & Tech Specialist Michael A. Robinson appeared on FOX Business' "Varney & Co." to discuss whether the most interesting companies of 2013 will make for next year's best investments. 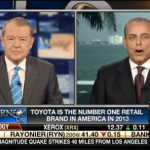 The four "interesting" companies highlighted by host Stuart Varney: Amazon.com Inc. (Nasdaq: AMZN), Netflix Inc. (Nasdaq: NFLX), Twitter Inc. (NYSE: TWTR), and Tesla Motors Inc. (Nasdaq: TSLA). Stock Market News Today, Dec. 27: U.S. stocks are yet again forging higher in this post-Christmas holiday. As of 10:30 a.m., the Dow Jones Industrial Average is up 22.5 points, or 0.14%, at 16,502.38. The Standard & Poor's 500 Index is up just 1.89 points, or 0.10%, at 1,843.91. The Nasdaq is up 2.70, or 0.06%, at 4,169.88. 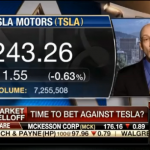 Tesla Motors Inc. (Nasdaq: TSLA) has seen a meteoric rise of 410% since the start of 2013, and the electric automaker is set to announce its third-quarter earnings tomorrow (Tuesday) after market close. TSLA climbed 8% today to $175.18 ahead of the report. 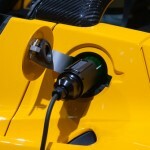 Analysts predict earnings of $0.11 per share for the electric automobile manufacturer. The California-based company suffered an earnings loss of $0.92 per share in the third quarter of 2012.